Resource availability may modulate interference interactions among competitors. For example, competition among stream fishes for drifting eggs from salmon (Oncorhynchus spp.) spawning events may be influenced by the availability of this energy-rich food source. This study used camera-based techniques to evaluate the effect of varied prey availability (i.e., pink salmon (O. gorbuscha) eggs) on rates of interference competition within natural stream fish communities at 10 sites. Aggressive interactions were quantified across different levels of egg additions, ranging from 6 to 3575 O. gorbuscha eggs, at 10 sites on the Keogh River, British Columbia, Canada. There were fewer aggressive interactions among salmonids (O. kisutch, O. mykiss, and O. clarkii clarkii) when there were more available eggs. Aggressive interaction rates were species-dependent; for example, the number of aggressive acts relative to null expectations based on abundances were highest in juvenile coho (O. kisutch) towards conspecifics. For some interactions, size of fish appeared to be a key factor as well. 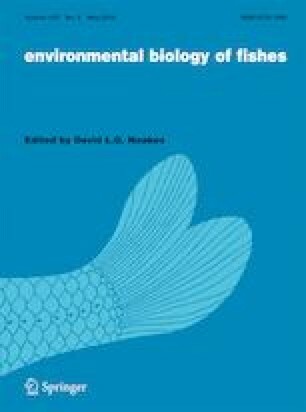 Thus, higher densities of spawning salmon in streams may provide sufficient prey resources in the form of eggs to temporarily decrease interference competition among stream fishes. C. J. Bailey and L. C. Andersson contributed equally to this work. The online version of this article ( https://doi.org/10.1007/s10641-019-00880-9) contains supplementary material, which is available to authorized users. Funding for this research was provided by the BC Ministry of Forests, Lands and Natural Resource Operations, the Habitat Conservation Trust Fund, Simon Fraser University, the Natural Sciences and Engineering Research Council of Canada (NSERC) and the Liber Ero Foundation. Special thanks to InStream Fisheries Research for their support in this research and all those who assisted in data collection: K. Chezik, C. Pan and K. Seitz. This study was funded by BC Ministry of Forests, Lands and Natural Resource Operations (grant no. 21653), the Habitat Conservation Trust Fund (grant no. 20520), Simon Fraser University, the Natural Sciences and Engineering Research Council of Canada (grant no.s 04066 and 507835) and the Liber Ero Foundation (grant no. 14334). All applicable international, national, and/or institutional guidelines for the care and use of animals were followed. All procedures performed in studies involving animals were in accordance with the ethical standards of the Canadian Animal Care Committee (CACC) and Simon Fraser University.